A major audit report setting out the research and innovation strengths of Wales has been presented to the UK Government today Friday 8 March 2019. The Science and Innovation Audit Report has been produced by the South Wales Crucible, which is backed by the Welsh Government and brings together Aberystwyth, Bangor, Cardiff and Swansea universities, research centres of excellence and internationally significant firms. Commissioned by Westminster’s Department of Business, Energy and Industrial Strategy (BEIS), the study outlines how the consortium can make positive and lasting steps to help unlock Wales’s innovation-led growth potential. The report confirms thematic areas that represent nationally and internationally significant capabilities, as well as a strong portfolio of globally competitive science and innovation assets that advance steel innovation, smart manufacturing, health innovation and agricultural-food tech. The audit of the Agri-Food Tech sector in Wales was led by Aberystwyth University and demonstrates the consortium's globally significant strengths across Agri-Food Tech research. The report highlights the work carried out by the University's Institute of Biological, Environmental and Biological Sciences on crop improvement, animal health and managing Agri-Food waste streams. The translation of these innovative process and technology developments will result in increased productivity and exports for major producers, and boost the long-term competitiveness of our food and drink processing industry. The report also highlighted the potential associated with the development of the £40.5m Aberystwyth Innovation and Enterprise Campus, funded by the European Regional Development Fund, the Biotechnology and Biological Sciences Research Council (BBSRC) and Aberystwyth University. Due for completion in 2020 and based at the Campus at Gogerddan near Aberystwyth, the new development will provide facilities and expertise to help businesses translate innovations and investments in Agri-Food Tech into new products, processes and services. Ken Skates, Welsh Government Cabinet Secretary for Economy and Transport, said: “In Wales we need a better understanding of how research and innovation drives productivity and growth, so that we can support those areas that provide the greatest opportunity to grow our economy, create jobs and develop skills. “I see this Audit as part of the evidence base of assets in Wales, which can be exploited to achieve our Government’s priorities. The South Wales economy is becoming more sophisticated and this Audit is a helpful tool to help us understand the current position and what we need to do to move forward. I welcome this Science and Innovation Audit, as it helps us understand the economy of Wales and enables us to plan for future investment. James Davies, Executive Chair of Industry Wales, said: “The opportunity afforded to us by this Science and Innovation Audit (SIA) is very timely. It is essential that we step forward collectively and confidently to engineer solutions that will enhance our society for common good. Professor Chris Thomas, Pro Vice-Chancellor for Research, Knowledge Exchange and Innovation at Aberystwyth University, said: “The South Wales Crucible Science and Innovation Audit recognises the considerable strengths in research and innovation in Wales and, particularly for Aberystwyth University, our leading role in world-leading Agri-Food Technology. Professor Hilary Lappin-Scott OBE, Chair of the South Wales Crucible Executive Sponsor Group and Senior Pro-Vice-Chancellor at Swansea University, said: “The core University members of our Science and Innovation Audit (SIA) South Wales Crucible consortium – Aberystwyth, Bangor, Cardiff and Swansea – recognise that we have a vital role to play in transforming the productivity performance of our region and we are constantly striving to make a positive difference at local, national and UK levels. Back for a second year, BioAccelerate is seeking up to twelve budding innovators for its 2019 cohort. BioAccelerate 2019 is a business accelerator helping to commercialise innovation in the biosciences, healthcare, agri-tech and food and drink sectors. The programme will help participants develop their innovations into market-ready propositions and will culminate in an opportunity to pitch to a panel of business leaders and industry experts. A joint initiative between the Aberystwyth Innovation and Enterprise Campus and Nurture Ventures, BioAccelerate 2019’s first workshop kicks off on Thursday 2 May 2019. The 8-week programme will blend intensive workshops with hands-on mentoring and support from the programme’s sponsors enables BioAccelerate to be offered free of charge to selected participants. Topics will include investment finance, R&D tax credits, intellectual property law, and defining a value proposition. Each workshop will also feature successful entrepreneurs sharing their stories and offering invaluable advice to participants. Applications for BioAccelerate 2019 will be open between Monday 4 and Thursday 28 March, when a selection panel will evaluate the Expressions of Interest with the potential for the highest commercial and social impact. Participants who complete the BioAccelerate programme can expect to develop their own business model canvas, financial projections, a defined market opportunity, a prospective company valuation and a pitch deck. The impact of last year’s BioAccelerate is clear to see, with many participants having made stark progress on their businesses since benefitting from the tailored support programme. Four of the previous cohort have since incorporated their companies at the Aberystwyth Innovation and Enterprise Campus, and continue to access the business support offered. The Aberystwyth Innovation and Enterprise Campus aims to help companies at all stages of development in Wales and beyond to realise their ambition and to grow, prosper and drive economic growth in the food and drink, biotechnology and agri-tech sectors. The ambitious £40.5m development is funded by the European Regional Development Fund, through the Welsh Government; the Biotechnology and Biological Sciences Research Council (part of UKRI); and by Aberystwyth University. The latest stage of construction at the Aberystwyth Innovation and Enterprise Campus has been marked with a special ceremony. Funders, university staff, community stakeholders and industry representatives gathered for a steel signing ceremony on Monday 12 November 2018 at Aberystwyth University’s Gogerddan campus. The event marked the completion of the steel frame for the new Campus’s Seed Biobank. Guests were invited to sign a steel beam, which was then lifted into place by a crane to become a permanent part of the structure of the building. There has been rapid progress over the last few months, with the preparation of the site’s foundations for the Seed Biobank and Biorefining Centre now complete. The principal contractor, Willmott Dixon, has also been busy diverting services and erecting the steel structure of the initial Campus buildings. The £40.5m development will foster collaboration between business and academia, providing world-leading facilities and expertise for the food and drink, biotechnology and agri-tech sectors, with funding from the European Regional Development Fund through the Welsh Government, the BBSRC – part of UK Research and Innovation - and Aberystwyth University. Aberystwyth Innovation and Enterprise Campus will also house an Analytical Science Centre and a Future Food Centre, and will be fully operational by the summer of 2020. Once open, the Campus will build on the existing capabilities within Aberystwyth University’s institutes, working particularly closely with the Institute of Biological, Environmental and Rural Sciences (IBERS) to facilitate enhanced access to the excellent research capabilities currently offered as well as shaping future translational research priorities. Willmott Dixon have been working with Ceredigion County Council to provide work placements and apprenticeship opportunities to young people in the area. One of the existing buildings, which will form part of the Aberystwyth Innovation and Enterprise Camps on the Gogerddan site, has already been refurbished to a high standard and provides over 300m2 of rentable office accommodation to the business community. The facility has been modernised to cater specifically for companies wishing to co-locate with leading researchers in the biosciences and agri-tech sectors. An ancient drink has been given a modern twist by the first manufacturing company to set up on the Aberystwyth Innovation and Enterprise Campus. Shire Meadery was established by Benjamin Guscott and Nelson Almeida in early 2018 to produce a contemporary version of mead, an alcoholic drink made with fermented honey. The idea for the new business became a reality after Benjamin and Nelson met at a student entrepreneur conference in February. After exploring several options for a base for their meadery, they decided that the Aberystwyth Innovation and Enterprise Campus buildings on Aberystwyth University’s Gogerddan campus near Penrhyncoch would be ideal. Benjamin Guscott, who has a PhD in Biosciences from Aston University, said: “I discovered mead when I was doing my doctorate, but only started making it myself much later. I approached mead-making from a scientific angle, experimenting with the most important components to make something with a much wider appeal than what is currently available. After a lot of testing, I created a formula for a contemporary mead which is less sweet and has a lower alcohol strength than traditional meads. Shire Meadery produced its first bottles of mead in July 2018 and full commercial production is now underway. Due for final completion in 2020, the Aberystwyth Innovation and Enterprise Campus will be a world-class facility which will attract both private and competitive research funding, enabling companies and researchers to undertake collaborative research projects to boost the bio-economy. The Campus underlines Aberystwyth University’s commitment to greater interdisciplinary research and innovation in a future that is increasingly focussed on cross sector research and development for new products and services. The £40.5m Aberystwyth Innovation and Enterprise Campus development is funded by the European Regional Development Fund, through the Welsh Government; by the Biotechnology and Biological Sciences Research Council (BBSRC) – part of UK Research and Innovation; and by Aberystwyth University. On 19 June, one of AberInnovation's newest members, Nemesis Bioscience, announced the completion of a seed funding round of £1.4m from a syndicate of new investors including Shionogi & Co Ltd, Coastal International Holdings and Wren Capital in addition to existing investors the Development Bank of Wales and the UK Innovation and Science Fund. On Wednesday 5 July, nine ambitious entrepreneurs were given the opportunity to pitch to a panel of investors and industry experts at the Aberystwyth Innovation and Enterprise Campus. The final pitch day marked the end of the 12-week BioAccelerate programme, Wales’ first business accelerator focused on commercialising bioscience and healthcare innovations. The programme, launched at BioWales 2018 in March, was a hands-on business accelerator helping to commercialise innovation in the bioscience and healthcare sectors across Wales. In a programme that blended workshops and one-to-one mentoring sessions, participants were given the opportunity to develop their innovations into market-ready propositions. Funded by the European Regional Development Fund through the Welsh Government, BBSRC – part of UK Research and Innovation and Aberystwyth University, the Aberystwyth Innovation and Enterprise Campus will offer a range of high quality facilities to support innovation, enabling commercial enterprises to grow, prosper and drive economic growth in the food and drink, bio-processing and biotechnology sectors throughout Wales and beyond. Over the course of a packed morning, the panel – including representatives from the Development Bank of Wales and Angels Invest Wales – heard a diverse range of pitches, with innovations including an indoor vertical aeroponic farm and engineered biocarbons to mitigate against adverse and contaminated soil conditions. While investments leading from the pitches were not expected, the participants all received valuable feedback on how much investment potential their innovations or business ideas had. Construction on the Aberystwyth Innovation and Enterprise Campus development began on 2 July and aims to help companies at all stages of development in Mid Wales and beyond to realise their ambition and to grow, prosper and drive economic growth in the food and drink, bio-processing and biotechnology sectors. Office spaces and meeting rooms have been available on the site for the past year, and the business community continues to grow as more tenants move in. AberInnovation held its first Office Block social gathering on Saturday 30th June 2018 with a litter pick along Borth Beach. 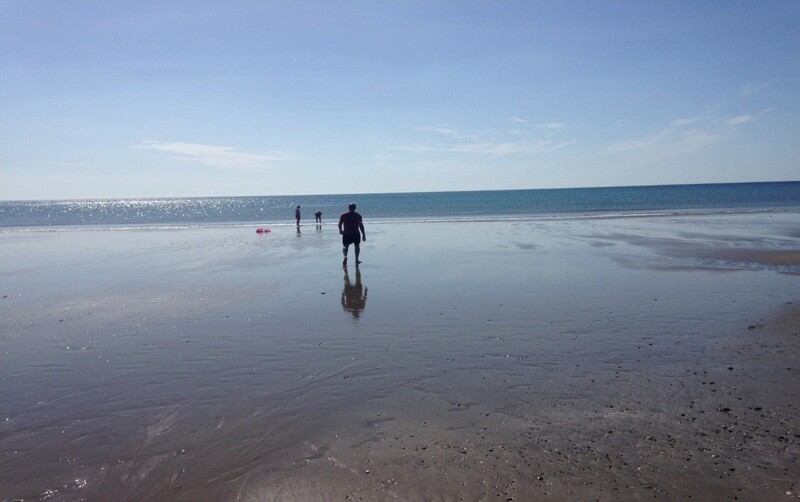 Members of AIEC staff, office block tenants, and their relatives worked their way along Borth Beach towards Ynyslas picking up litter, taking time out for a quick dip in the sea to cool off as it was a scorching sizzler of a day! The Caru Ceredigion Team at the County Council very kindly loaned all the equipment for free and we collected all sorts of plastics, bits of nylon fishing net, drink cans/bottles, an old pair of socks and even a nappy – gross! We all felt that we’d achieved something worthwhile and plan to make it a regular event! 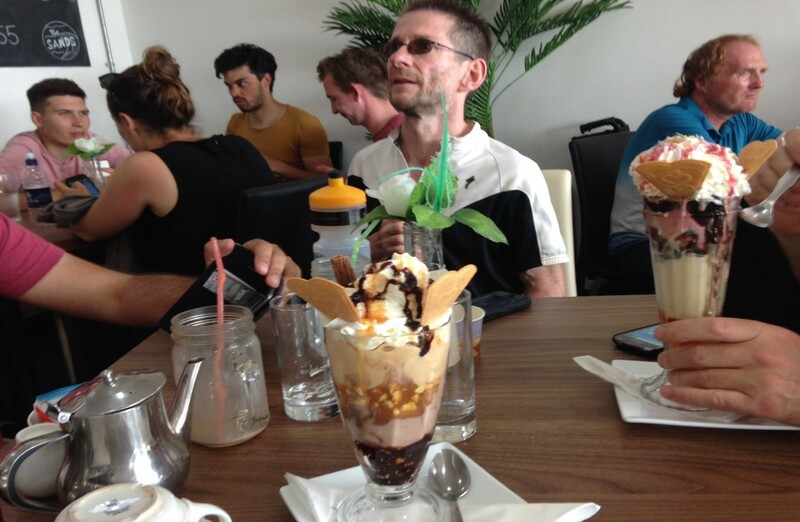 Enjoying a well-earned reward at the Sands Café in Borth! Aberystwyth Innovation and Enterprise Campus welcomed delegates for an event titled ‘Innovative Marketing: Masterclass’ on Wednesday 20 June. Forming part of the Wales Festival of Innovation – a pan-Wales showcase of innovation in the business world and academia – the event featured presentations on different aspects of marketing from three industry practitioners. As usual, the event started with a networking lunch as delegates arrived and registered. The presentations were then kicked off with Anthony McAllister from Cardiff-based design consultancy PDR, who spoke about the importance of good design in marketing. Having recently worked with restaurant chain Las Iguanas on a re-design of a line of table wear, Anthony was able to describe the design process in detail, and how the work formed a key part of the restaurant chain’s brand and positioning. Following this, Eifion Loosley described his work as Marketing Manager at Aber Instruments and their journey so far. Having recently expanded into new space over at the Aberystwyth Science Park to coincide with their 30th anniversary, Eifion had some very valuable insights into managing the marketing demands of a fast-growing local company with a very diverse customer base. Last up was Francesca Irving, founder and Managing Director at full-service marketing agency Lunax Digital. Francesca delivered a presentation on one of her favourite topics: cognitive biases in e-commerce. Following the presentations, light refreshments were served as delegates enjoyed an opportunity to have breakout discussions with the speakers. The Wales Festival of Innovation is a showcase of innovation in Wales and runs for two weeks from 16 – 30 June. Its aim is to facilitate the exchange of ideas and concepts that will create collaborations and inspire innovative new products, solutions and cultural endeavours in Wales. The £40.5m Aberystwyth Innovation and Enterprise Campus is the largest development of its kind in Mid Wales in recent years and will be a catalyst for economic development. The new Campus will offer a range of high quality technical facilities and specialised equipment to support innovation, enabling commercial enterprises to grow, prosper and drive economic growth in the areas of food and drink, biorefining and waste stream valorisation throughout Wales and beyond. BioAccelerate, Wales’ first business accelerator focused on commercialising bioscience and healthcare innovations, is seeking its first cohort of twelve early-stage innovators. Formally launched at BioWales 2018 at the Wales Millennium Centre in Cardiff, the BioAccelerate programme’s first workshop will take place 19th April 2018 and is a joint initiative between the Aberystwyth Innovation and Enterprise Campus and Nurture Ventures. The 12-week programme will be an intensive mixture of workshops and hands-on mentoring with support from the programme’s sponsors enabling BioAccelerate to be offered free of charge to selected participants. BioAccelerate is a hands-on business accelerator helping to commercialise innovation in the bioscience and healthcare sectors across Mid and West Wales. The programme will help participants develop their innovations into market-ready propositions and will culminate in giving them an opportunity to pitch for investment to a panel of industry experts. Participants who complete the BioAccelerate programme can expect to develop their own business model canvass, financial projections, a defined market opportunity, a prospective company valuation and a pitch deck. The programme seeks to recruit up to twelve innovators in its first cohort. Expressions of interest are invited as of last week and will help the recruitment panel to select the companies with the potential for the highest commercial and social impact. The programme will be structured to combine workshops with tailored mentoring, covering topics such as pricing, intellectual property and company valuation methods. With delivery led by Nurture Ventures, the tailored support aims equip the selected participants with an investment ready value proposition for their innovation in time for the pitch day, where participants will have the opportunity to complete for seed money and showcase their progress over the 12-week scheme. Aberystwyth Innovation and Enterprise Campus aims to help companies at all stages of development in Mid Wales and beyond to realise their ambition and to grow, prosper and drive economic growth in the food and drink, bio-processing and biotechnology sectors. The European Regional Development Fund, through the Welsh Government; by the Biotechnology and Biological Sciences Research Council (BBSRC); and by Aberystwyth University, funds the ambitious £40.5m Aberystwyth Innovation and Enterprise Campus development. In an event titled ‘Making Time for Innovation: Prioritising R&D for Success’, Aberystwyth Innovation and Enterprise Campus hosted delegates on 9th February for its first business support event of the year. Based on feedback from previous attendees the Campus brought together several experts in the innovation and research and development fields to present on how to cultivate an innovative mindset, R&D tax credits available to companies that pursue specific research and development activity and several public sector initiatives across Wales that can support businesses to succeed in the challenging area of innovation and speculative R&D. Following a networking lunch, delegates heard from four speakers: Bruce Stanley, Embody Ltd; Simon Renault, Innovation Point (Newport); Ian Mitchell, Mitchell Meredith Accountants; and Chris Probert, Innovation Specialist at the Welsh Government. The event was brought to a close with coffee and breakout sessions, where delegates could speak to any of the presenters one-to-one for a chance to ask questions about their specific needs. Aberystwyth Innovation and Enterprise Campus will offer a range of high quality facilities to support innovation, enabling commercial enterprises to grow, prosper and drive economic growth in the food and drink, bioprocessing and biotechnology sectors throughout Wales and beyond. Facilities will include an analytical science centre, a pilot-scale bioprocessing and biorefining facility, and a food-grade future food centre. In addition, available now on the Campus are several rentable office spaces of varying sizes and at various tenancy packages, for a community of likeminded innovators and entrepreneurs. Aberystwyth Innovation and Enterprise Campus (AIEC) is pleased to welcome its second full-time tenant - integrated bio-refining company Phytatec Ltd. The move builds on a long-standing collaboration between Phytatec Ltd and Aberystwyth University, where its founder, Dr. Steve Bowra has collaborated with academic staff in the fields of crops improvement and biorefining over many years. Phytatec Ltd has been working in the biosciences sector since July 2002, developing technologies that support the transition towards a bio-based economy. The company will take tenancy at the Aberystwyth Innovation and Enterprise Campus from 1st December 2017 to join the burgeoning business community in mid-Wales. Based on Aberystwyth University’s Gogerddan Campus, the Aberystwyth Innovation and Enterprise Campus will provide state-of-the-art facilities for its collaborators and partners, including a biorefining and bio processing facility; an advanced analytical science centre; and a future food centre. Ahead of completion of the main construction project, the Campus already boasts fully-furnished office spaces where tenants like Phytatec Ltd can meet likeminded innovators and enjoy access to world-leading expertise in the agri-tech and biosciences sectors. “Our offices will appeal to companies with ambitions to grow and take new ideas to market. Our facilities, refurbished to a very high standard, will cater specifically to companies wishing to be part of a growing business community for the biosciences and agri-tech sectors,” she added. Aberystwyth Innovation and Enterprise Campus (AIEC) hosted a Business Planning and Pitching event at Aberystwyth University’s Gogerddan Campus on 30th November. As part of its ongoing commitment to help company collaborators and tenants by bringing the business support community to them, the Aberystwyth Innovation and Enterprise Campus holds regular events and workshops for businesses and entrepreneurs. As well as a networking lunch for its delegates, the free event comprised of presentations from three speakers: Jeff Bartlett, Nurture Ventures; Julian Sanders, Sanders Design; and Zoe Reich from the Development Bank of Wales. Topics were wide-ranging and included ‘The Essentials of Customer Engagement’, ‘Innovation, Design and Branding’, and ‘Investment Readiness’. Tenants at Aberystwyth Innovation and Enterprise Campus can enjoy ample networking opportunities with likeminded innovators as well as access to world-leading expertise in the agri-tech and biosciences sectors. In addition to hosting workshops and events, Aberystwyth Innovation and Enterprise Campus also offers a range of fully-furnished office spaces at its recently renovated site. Commenting on the success of the event, lead speaker Jeff Bartlett said: "Fantastic turnout and discussions at yesterday's Business Planning and Pitching event. The attendance level really underlies the latent potential that exists in west Wales with a wide variety of innovative business ideas amongst the attendees." Due for completion in late 2019, Aberystwyth Innovation and Enterprise Campus will be a world-class facility which will attract both private and competitive research funding, enabling companies and researchers to undertake collaborative research projects to boost the bio-economy. The Campus underlines Aberystwyth University’s commitment to greater interdisciplinary research and innovation in a future that is increasingly focussed on cross sector research and development for new products and services. The 2018 edition of Aberystwyth University’s student enterprise competition has been launched, with a £10,000 prize on offer to the winning entry. InvEnterPrize, now in its fourth edition, offers entrepreneurial students an opportunity to pitch their ideas to a panel of distinguished, successful Aberystwyth University alumni chaired by Professor Donald Davies of Imperial College, London. The successful entry will be able to invest its winnings in equipment, facilities or professional services to turn an invention or business start-up idea into reality. Also up for grabs this year will be free office space for one year at the Aberystwyth Innovation & Enterprise Campus, which is offered for proposals for the bio-sciences, life sciences and agriculture sectors. However, InvEnterPrize is not just about winning the top prize. Entrants will be able to seek expert advice and attend a series of workshops and presentations led by successful entrepreneurs as they develop their final bids, gaining valuable advice on the way. A short list of finalists will be invited to present their business propositions to the panel of judges in a Dragon’s Den event on Monday 19 March 2018. The 2018 edition was launched on Monday 13 November by Professor Elizabeth Treasure, Vice-Chancellor of Aberystwyth University. This year’s entrants will be looking to emulate the success of Kar-go, who scooped the top prize in 2017. The brainchild of students Ariel Ladegaard and Aparajit Narayan, and former student Pasi William Sachiti, Kar-go is a concept driverless delivery vehicle. Ariel and Pasi were presented with a cheque for £10,000 by The Apprentice winner Alana Spencer. Sponsored by contributions from the University’s alumni, InvEnterPrize is organised by the University’s Careers Service. The original concept has been developed over several years by the University’s entrepreneurship champion, Tony Orme. Launched in 2012, the inaugural InvEnterPrize winner was Jake Stainer and his language learning website www.Papora.com. Aberystwyth University offers a full programme of events to support entrepreneurial activity amongst students, alumni and staff. To find out more visit the AberPreneurs online pages here. An award-winning company set up by a former Aberystwyth student has become the first full-time tenant of Aberystwyth Innovation and Enterprise Campus (AIEC). Gloversure Ltd, an award-winning company head quartered in Welshpool, mid Wales, and working in the internet / telecoms industry since July 2004 will take tenancy at Aberystwyth Innovation and Enterprise Campus from June 2017 to further its ambitions with its in-house development in the agri-tech area and to recruit skilled graduates from Aberystwyth University. Set just 3 miles inland from Aberystwyth town, the new office accommodation will provide tenants with exceptional links to the expertise at Aberystwyth University. The offices will appeal to companies with ambitions to grow and take new ideas to market. The facility, refurbished to a very high standard, will cater specifically to companies wishing to be a part of a growing business community for the biosciences and agri-tech sectors. The new office accommodation is part of the £40.5M Aberystwyth Innovation and Enterprise Campus project; one of the largest infrastructure developments in Wales in recent years, which will be a catalyst for economic improvement. The Innovation Campus will offer technical facilities to support innovation in the food & drink, biorefining and biotechnology sectors throughout Wales and beyond. Scheduled for completion in 2019, the Campus will host companies from supply chains across the UK, supporting the community of local business to develop wider links and new partnerships. Dr Timothy Brain OBE, Chairman of AIEC Ltd, addressed the assembled guests about Aberystwyth Innovation and Enterprise Campus’ proposed offer of a range of world leading facilities and expertise to support innovation. Dr Brain also outlined the project’s vision of enabling commercial enterprises to grow, prosper and drive economic growth in the food and drink, bio-processing and biotechnology sectors throughout Wales and beyond. The £40.5M project is funded by the European Regional Development Fund, through the Welsh Government; by the Biotechnology and Biological Sciences Research Council (BBSRC) and by Aberystwyth University. The Wales in London Annual St David’s Day Celebration which began in 1904,is an opportunity for Welsh men and women who live and work in London to come together to celebrate the best of what Wales has to offer. The event has a long tradition of attracting very influential dignitaries with The Secretary of State for Wales, the Rt Hon Alun Cairns MP present at this year's celebration. The speakers were the Rt Hon Lord Judge, former Lord Chief Justice for England and Wales and Guto Harri, MD External Communications Liberty Global. Gaenor Howells who organises the event said "I hope that friends of the Dinner will be supportive of this much needed project in Ceredigion. Wales in London looks forward to continuing our relationship with Aberystwyth Innovation and Enterprise Campus." The event coincided with the 125th Anniversary of Aberystwyth University’s Old Students Association (OSA), which is one of the oldest alumni associations of its kind in the world with over 9,000 members scattered across more than 150 different countries. A final planning application for Aberystwyth Innovation and Enterprise Campus has been submitted to Ceredigion County Council with a decision expected in the Spring of 2017. If planning permission is granted, construction is due to start mid-2017 and is expected to take two years to complete. The Aberystwyth Innovation and Enterprise Campus (AIEC) has taken a major step forward following the successful appointment of a Principal Contractor. Wilmott Dixon Construction secured the Pre-Construction Service Agreement following a competitive procurement process. The company will bring a wealth of experience to the project having previously delivered other capital build projects for the scientific and educational sectors in Wales. The Aberystwyth Innovation and Enterprise Campus will provide world leading facilities and the expertise to create market focused solutions for the agri-tech industry. It has been funded from the European Regional Development Fund, through the Welsh Government; the Biotechnology and Biological Sciences Research Council (BBSRC), and Aberystwyth University. Wilmott Dixon will work closely with the project design team over the next few months to further develop a detailed technical design for the new campus. “Following a robust procurement process, I am delighted to confirm the appointment of Wilmott Dixon Construction as the Principal Contractor to build the AIEC development. The announcement represents a significant milestone for the project and brings us a step closer towards turning the vision into reality” said Huw Watkins, AIEC Project Director. Speaking on behalf of Willmott Dixon Construction, Neal Stephens, managing director said, “We will work with the design team, using our experience and capabilities to provide the best solutions for the Aberystwyth Innovation and Enterprise Campus and its world-class facilities to drive growth in the economy." Proposed facilities at the AIEC include a Bio-refining Centre, Future Food Centre, Analytical Science laboratories and a Seed Processing and Biobank Facility. It will also provide formal and informal meeting areas and office/laboratory accommodation for companies committed to innovate. The AIEC will build on the existing capabilities within Aberystwyth University’s Institutes, working particularly closely with the Institute of Biological, Environmental and Rural Sciences (IBERS) to facilitate enhanced access to the excellent research capabilities currently offered as well as shaping future translational research priorities. One of the existing buildings which will form part of the AIEC on the Gogerddan site has already been refurbished to a high standard and provides over 300m2 of rentable office accommodation to the business community. Located at Gogerddan, the new development will provide a progressive environment to encourage business and academic collaboration to flourish and will offer a range of high quality facilities to support translational research and innovation, enabling commercial enterprises to grow, prosper and drive economic growth in Mid Wales and beyond. A final planning application for the Campus has been submitted to Ceredigion County Council with a decision expected in the Spring of 2017. If planning permission is granted, construction is due to start mid-2017 and is expected to take two years to complete. Aberystwyth University, together with the Aberystwyth Innovation and Enterprise Campus (AIEC), has formally submitted a full planning application to Ceredigion County Council. Based on Aberystwyth University’s Gogerddan campus, the £40.5m AIEC development will feature a bio-refining centre, future food centre, analytical science laboratories and a seed processing and biobank facility. The full application comes following a comprehensive public consultation period where interested parties had an opportunity to learn more about the proposed improvements to the existing Gogerddan campus on the outskirts of Aberystwyth. The consultation process also provided the project team with helpful and informative feedback to assist with the preparation of the final application. Funded by the European Regional Development Fund through the Welsh Government; the Biotechnology and Biological Sciences Research Council (BBSRC) and by Aberystwyth University, the Innovation and Enterprise Campus will provide world leading facilities and the expertise to create market focused solutions for the agri-tech industry. Planning consultant Cushman & Wakefield has been integral to this process, particularly in supporting the AIEC project team with the preparation and submission of the planning application. “The submission of the planning application is a significant milestone for the AIEC project. It is the result of extensive pre-application engagement and dialogue with Ceredigion County Council and local stakeholders, with the cooperation and collaboration of all parties being the key to its successful submission and validation in line with the critical path project delivery programme” said Andrew Teage, Associate – Planning and Development at Cushman & Wakefield. AIEC will provide a progressive environment to encourage business and academic collaboration to flourish, by offering a range of high quality facilities to support the translation of research and innovation, enabling commercial enterprises to grow, prosper and drive economic growth in Mid -Wales and beyond. AIEC will also provide formal and informal meeting areas and office/laboratory accommodation for companies. It will build on the existing capabilities within Aberystwyth University’s Institutes, working particularly closely with the Institute of Biological, Environmental and Rural Sciences (IBERS) to enhance, and enable access to, the excellent research capabilities currently offered. One of the existing buildings which will form part of the AIEC on the Gogerddan site has already been refurbished to a high standard and provides over 300m2 of rentable office accommodation to the business community. The facility has been modernised to cater specifically for companies wishing to co-locate with leading researchers in the biosciences and agri-tech sectors. A decision on the planning application is expected in the Spring of 2017. If planning permission is granted, construction is proposed to start mid-2017 and is expected to take two years to complete. Aberystwyth Innovation and Enterprise Campus Limited is delighted to announce the appointment of its first Chief Executive Officer. Dr Rhian Hayward MBE will take up the post in January 2017 and will lead the newly formed joint venture between Aberystwyth University and the Biotechnology and Biological Sciences Research Council, which has been created to build and operate the proposed Innovation and Enterprise Campus (AIEC) on the outskirts of Aberystwyth. Dr Hayward brings a wealth of highly relevant experience gained over twenty-five years in both the private and public sectors focused on bringing products to market in the life sciences sector. She takes up the CEO role following her recent post as Head of Knowledge Exchange at the Department of Research, Business & Innovation at Aberystwyth University. Prior to joining Aberystwyth University, Dr Hayward worked in the private sector running a consultancy business advising investors, universities and SMEs on the commercialisation of early stage life science technologies. Dr Hayward has also held several commercial roles in marketing, business development and product management within the biotechnology industry. “I am delighted to lead the Aberystwyth Innovation and Enterprise Campus and to offer companies a step change opportunity to innovate in collaboration with Aberystwyth University experts,” said Dr Hayward. After gaining a BSc. first class honours degree in Biology from King’s College, London, and completing her doctorate at the University of Oxford, Dr Hayward went on to undertake postdoctoral research at the National Institute of Health, Bethesda, USA. Moving into industry, Dr Hayward then held several positions within start up and spin out companies in the south east of England. Originally from Swansea, Dr Hayward was awarded an MBE for services to Entrepreneurship in Wales in the Queen’s 2016 Birthday Honours list. As Chief Executive Officer for Aberystwyth Innovation and Enterprise Campus Limited, Dr Hayward will be responsible for providing operational leadership and ensuring the sustainability of the new campus, and contributing to driving economic growth in the region and beyond through the creation of high value jobs and a thriving campus community of knowledge-based companies. Funded by the European Regional Development Fund, through the Welsh Government; the Biotechnology and Biological Sciences Research Council (BBSRC) and by Aberystwyth University, the Innovation and Enterprise Campus will provide world leading facilities and the expertise to create market focused solutions for the agri-tech industry. The AIEC will build on the existing capabilities within Aberystwyth University’s Institutes, working particularly closely with the Institute of Biological, Environmental and Rural Sciences (IBERS) to enhance, and enable access to, the excellent research capabilities currently offered. A final planning application for AIEC will be submitted in late 2016. Proposed facilities at the AIEC include a Bio-refining Centre, Future Food Centre, Analytical Science laboratories and a Seed Processing and Biobank Facility. It will also provide formal and informal meeting areas and office/laboratory accommodation for companies. Aberystwyth University and AIEC Limited held a Community Consultation Event at Penrhyncoch Village Hall on Tuesday 18th October as part of a 28-day consultation period on the draft planning application for Aberystwyth Innovation and Enterprise Campus. The event was an opportunity for any interested parties to learn more about the proposed improvements to the existing Gogerddan campus. It also provided the project team with helpful and informative feedback to assist with the preparation of the final planning application, to be submitted in late 2016. Proposed facilities at the AIEC include a Bio-refining Centre, Future Food Centre, Analytical Science laboratories and a Seed Processing and Biobank Facility. It will also provide formal and informal meeting areas and office accommodation. The AIEC will drive economic growth in the region and beyond through the creation of high value jobs and thriving knowledge based companies. It will build on the existing capabilities already in existence within the University’s Institutes, working particularly closely with the Institute of Biological, Environmental and Rural Sciences (IBERS) to enhance the excellent research capabilities currently offered. Aberystwyth University and AIEC Limited are preparing to submit a detailed planning application later in 2016 for the new Aberystwyth Innovation and Enterprise Campus (AIEC), and will be hosting a Community Consultation Event at Penrhyncoch Village Hall on the 18th of October. The event will provide an opportunity for any interested parties to learn more about the proposed improvements to the existing Gogerddan campus. The evening will begin with a public drop-in session from 5.30pm, followed by a presentation of the AIEC proposals at 7pm. Based on the outskirts of Aberystwyth at the University’s Gogerddan Campus, the AIEC will provide world leading facilities and the expertise to create market focused solutions for the agri-tech industry. “The event has been organised to allow the local community the opportunity to engage directly with the AIEC project at the earliest possible stage. We look forward to sharing our exciting vision for the investment and present the proposed plans to make it a reality” said Huw Watkins, AIEC Project Director. Proposed facilities will include a Bio-refining Centre, Future Food Centre, Analytical Science laboratories and a Seed Processing and Biobank Facility. It will also provide formal and informal meeting areas and office accommodation. Whilst the new Innovation Campus will enhance the University’s capacity in the agri-tech sector, staff and student numbers at the Gogerddan site will be consistent with current University arrangements. Andrew Teage, Associate at Cushman & Wakefield leads the consultant team providing planning guidance and advice for the project. Andrew will facilitate the consultation event, and along with colleagues will be on hand to answer questions related to the proposals and the planning application process itself. The AIEC is funded by the European Regional Development Fund, through the Welsh Government; the Biotechnology and Biological Sciences Research Council (BBSRC) and by Aberystwyth University. AIEC Limited and Aberystwyth University are delighted to announce that the public procurement process to appoint a Principal Contractor for the Aberystwyth Innovation and Enterprise Campus (AIEC) project has formally begun with the release of a Prior Information Notice (PIN). AIEC Limited and Aberystwyth University intend to jointly conduct the procurement with AIEC Limited acting as the Contracting Authority, managing the procedure on its own behalf and on behalf of Aberystwyth University. The PIN was recently released through Sell2Wales and the Official Journal of the European Union procurement portals, and two Pre-Procurement Market Engagement Events have been organised to provide an opportunity for the construction supply chain to discover more about the AIEC project. The first event will be held in Aberystwyth on Thursday 26 May 2016 with the second event taking place in Cardiff Bay on Friday 27 May 2016. Parties interested in attending either or both of the events must register before 4pm on Wednesday the 18th of May 2016 by emailing aiecadmin@aber.ac.uk and supplying the names, email addresses and job titles of each person attending (a maximum of 2 people from each organisation). The events are open for all construction suppliers to attend (according to the scope of the PIN), but attendance must be pre-registered as described above. One of the existing buildings which will form part of the AIEC on the Gogerddan site has already been refurbished to a high standard and provides over 300m2 of rentable office accommodation to the business community. The facility has been modernised to cater specifically for companies wishing to get closer to the world leading research excellence undertaken by scientists at IBERS (Aberystwyth University’s Institute of Biological, Environment and Rural Sciences). AIEC Limited, the new joint venture between Aberystwyth University and the Biotechnology and Biological Sciences Research Council is delighted to announce the appointment of the consultant teams to assist with the new development. Funded by the European Regional Development Fund, through the Welsh Government; the Biotechnology and Biological Sciences Research Council (BBSRC) and by Aberystwyth University, the Innovation and Enterprise Campus will provide world leading facilities and the expertise to create market focused solutions for the agri-tech industry. AECOM Professional Services LLP will provide Project and Cost Management services for the major construction project which will take place on Aberystwyth University’s Gogerddan campus on the outskirts of Aberystwyth. Following a full Official Journal of the European Union procurement process, AECOM were awarded the contract after a fierce and close competition between a number of high profile bidders. One of the existing buildings on the Gogerddan site has already been refurbished to a high standard and will provide over 300m2 of rentable office accommodation to the business community. The facility has been modernised to cater specifically for companies wishing to get closer to the world leading research excellence undertaken by scientists at IBERS (Aberystwyth University’s Institute of Biological, Environment and Rural Sciences). The Aberystwyth Innovation and Enterprise Campus has been funded by the European Regional Development Fund, through the Welsh Government; by the Biotechnology and Biological Sciences Research Council (BBSRC) and by Aberystwyth University. An event focused on Funding and Facilities for Innovation was recently held at Aberystwyth University providing companies with an early preview of the progress being made towards turning the £40.5m investment in a new Innovation and Enterprise Campus into reality. The event, which took place on 19 November saw more than 30 different companies attending, from local food manufacturers to multinational agri-tech businesses. It provided delegates with an early engagement opportunity to explore how the proposed developments can support and contribute to their specific business growth aspirations. Opened by Professor Chris Thomas, Pro-Vice Chancellor for Research at Aberystwyth University, one of the main purposes of the event was to share how a combination of scientific excellence, state of the art facilities and new funding packages could drive innovation and growth within the food, health, agri and biotech industries. It also provided an opportunity for delegates to contribute and shape future provision to maximize the potential for entrepreneurial activity. Speakers at the event included Huw Watkins, Project Director of AIEC who outlined the possibilities for facilitating growth at Aberystwyth Innovation and Enterprise Campus and Professor Jamie Newbold, Director of Research at Aberystwyth University’s Institute of Biological, Environment and Rural Sciences (IBERS) who provided an update on IBERS’ Research Strategy. Presentations were also given by Welsh Government representatives who provided information on the SMART Funding suite for Innovation in Wales. The event concluded with an ‘Ask the Panel’ open floor discussion, providing delegates with an opportunity to ask any burning questions arising from the mornings’ activities. Reflecting on the event, Huw Watkins AIEC Project Director said “Significant progress has been achieved since the investment was secured nearly a year ago and we felt it was timely for us to share some of that information with companies who are likely to benefit from the project. This was the first of many such events designed to raise awareness and encourage early engagement”. Dr Jonathan Hughes from Pennotec attending the event added that “the single site AIEC facility could foster closer engagement between green technology companies with producers and product end-users in our agri-food and health sectors”. The proposed footprint for the Innovation and Enterprise Campus at Gogerddan on the outskirts of Aberystwyth has been formally approved by the Project Board, and next steps will include further design development, obtaining planning approval and procurement of a main contractor. A proposed supply chain event will also be held in the Spring of 2016. One of the existing buildings on the Gogerddan site has already been refurbished to a high standard and provides over 300m2 of rentable office accommodation. The facility has been modernised to cater specifically for companies wishing to get closer to the world leading research excellence undertaken by scientists at IBERS.